Fridays are such a mixed bag when it comes to trying to connect with our unhurried God. On the one hand, it is a day that, at least for many, represents the last bit of work for the week and the possibility of some weekend rest on the horizon...something that could help us find the unhurried God. However, too often we end up balancing so many commitments that our weekends, and our Fridays specifically, can be even fuller than our weekdays. We often end up tacking on extra Friday evening activities and commitments, we try to add in some time to clean up the house or do some laundry, or we pull even longer hours than normal trying to wrap up some work that the boss said we had to finish by the end of the week. For those in retail it is even worse as Friday signals the beginning of the busiest time of the week--far from a time for rest. Wherever you are in your day, week, or weekend plans, can you take a few minutes now to intentionally slow your pace? Here is one idea for you to try. Since there are 48 hours in a typical 2-day weekend, I encourage you to find a still place to sit and prayerfully slow down as you count 48 breaths: in and out 1, in and out 2, in and out 3. If you’ve been racing to and fro, let this be a chance to slow your breathing down a bit. The Holy Spirit is described as the breath of God. God breathed life into Adam’s nostrils in Genesis 2. Let's take these 48 breaths and use them to reflect on the way that God’s Holy Spirit is constantly breathing life into our bodies. If you want to receive these daily meditations, simply click here to sign up. 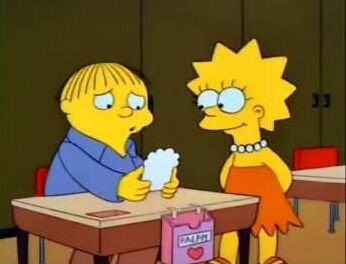 The only Valentine’s Day card I can remember the message of was actually a Valentine given to Chief Wiggum’s not-so-bright son Ralph by Lisa Simpson when she noticed that no one cared to give him a card on Valentine’s Day. Her card, featuring a locomotive train, read: “I Choo-Choo-Choose You, Happy Valentines.” While this made for yet another hilarious episode of The Simpsons, it does fail, as all commercialized versions of Valentine’s Day do, to convey the deep history of this former Catholic Holy Day. And, cousin mine, upon Monday is Saint Valentine's Day and every bird chooses himself a mate, and if it like you to come on Thursday night, and make provision that you may abide till then, I trust to God that ye shall speak to my husband and I shall pray that we may bring the matter to a conclusion. And so on this day that we celebrate love, we also pause to remember two saints whose memory has been all but lost. But even with the loss of details we can be grateful and thankful for two men of faith who so believed in their God and so proudly loved Christ that they gave their lives for the sake of that adoration. And that is the kind of love the Church can and should strive to emulate both today and every day. This weekend my husband, Kevin, ran into God at Starbucks. He probably wouldn't put it that way, but that's the way this preacher sees it. Kevin walked into a Starbucks in a city in another state. It was 6:15am, and there was a group of four conservatively-dressed, middle-aged, white men seated at a table together. The Bibles and study books in front of them immediately gave away the fact that they were a part of an early-morning Christian study group of some sort. Sadly, this God encounter will not come from this group of Christian men. As Kevin took his place in the short early-morning line, he heard one of the men rather loudly state, "I am an intelligent person. I understand things, complicated things. I know the difference between right and wrong. Homosexuality is wrong. God says it in the Bible." It took Kevin aback to hear such words spoken so loudly, especially at a Starbucks. At the same moment, it was his turn in line, and the barista looked at him and said, "Are you okay?" Though she hadn't hear the man's pronouncement, she could see in Kevin's face, and probably the lack of color in it, that something had just happened. Kevin fumbled for words. He even tried to pass it off that everything was fine, but she insisted. "I can tell something is wrong. What is it?" Kevin shared the experience he had just had, explaining that it is nothing new for LGBTQ folks but that it just caught him off-guard so early in the morning. This young barista responded with a wisdom well beyond her years, "It is not okay that this is nothing new, and you shouldn't have to be 'on guard.' Especially not here. I'm so sorry, and your coffee this morning is going to be on me." The irony in this true story is rampant. From the aloof, self-righteous Christians to the compassionate care of a young minimum wage employee, this story plays out more like a Jesus story from the Bible than a modern day set of events at an international, corporate chain coffeehouse. All these years later, we still see the same characters: religious leaders and authority figures totally missing the point, leaving outsiders and outcasts to save one another continually with the unconditional love of God. To be clear, the God-Encounter was not the free cup of coffee. This is not a Western tale of capitalist healing after all. The coffee was simply a kindness, not a God-moment. The God-Encounter was this young girl seeing the disturbance and hurt in Kevin's face, refusing to let it go or brush it off, and then offering the compassionate and Godly care of reminding Kevin that he is good. This week has been a rough one. The ban on trans people in the military was reinstated by our country's Supreme Court. 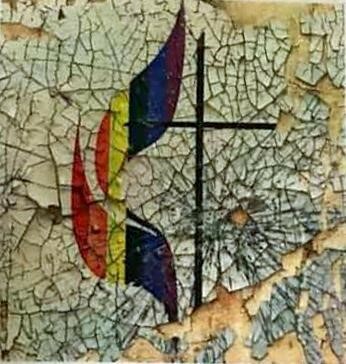 Federal Employees, including those in our own congregation, have now completed their second pay period without compensation, and in South Carolina, the ability to discriminate against foster parents who are LGBT, Jewish, or other formerly-protected-groups was removed. Our world needs people who see the distress and hurt in others. Are you paying attention, looking people in the eyes, and asking, "No really, what's wrong?" Will you embody this one humble barista or that other poor carpenter from two millennia ago as you go through your day today? Let's be MCC today. It's as important now as ever. In January and February, Rev. Wes is doing a sermon series, A Way Out of No Way. In this series, we will enter the biblical narrative of Gods’ action in human history “already in progress,” and right out of the gate we are plopped down in the middle of major crisis: Noah and the flood. We will spend six weeks witnessing other Hebrew Bible stories of God urging the people forward in times when it seems there’s no way out. We will recall our own narratives and affirm the strength God gives us to find a way-through. After all, our percentage of actually living through a crisis at this point is 100%. Could you use a bit more joy in your life? Most of us would respond with a resounding 'Yes!' to that question. Joy is something you can't ever really have too much of. This Sunday we will follow the angels as they come to Joseph in a dream and point him in the direction of more joy. What have you been dreaming about lately? Have you ever wondered if one of your dreams could be a message from God? All this and more on Sunday. Join us! This Sunday our Advent series focusing on the angels will continue with the message, "More Peace." Remember that you are invited to bring any angel figurines that you have and add them to our angel-themed Advent Wreath. To help get us prepared for this Sunday's message, consider that the first words from the Angel to Mary: "Do not be afraid." This phrase is actually the most common in all the Bible. It is used 365 times, which "just happens" to be one for every day of the year. Perhaps that is a cue to us about how important it is for us to repeat every day, "I do not need to be afraid." As you prepare for worship this Sunday when we will explore the Advent invitation to a life of "More Peace," I invite you to think about the angelic admonishment to trust the new thing God is preparing to do by reminding us, "Do not be afraid!" Are you prepared to let go of your fears and trust God? Are you open to the path of peace...even if it includes change? There are all sorts of ways that we can sometimes feel alone. Perhaps the easiest to point to is how we can feel alone at night in an empty house. But we can also feel alone in the middle of room full of people gathered for a company holiday party. Sometimes it has little to do with the people around us, like when we feel alone even when we are surrounded by our closest friends. Sometimes it has a lot to do with the company we are keeping, like when we feel alone while visiting the home of a family member who does not accept us. The point is we all feel lonely sometimes. As we enter the holiday season which can bring many joys but also some loneliness, I encourage you to remember that you are never alone...even though we all feel lonely sometimes. In those moments when your heart is aching, in those moments when you wish someone would slow down and really see you, or in those times when your entire body seems to scream out for someone to just hold you so you know you are safe and loved...in whatever form those painful lonely feelings may take in you, remember you are never alone. Close your eyes and try to visualize every detail, every feeling, every sound, of climbing up in the lap of Jesus and being held. Try things like this: In your mind's eye try to see the way the clothes are laying on Jesus's chest as you lay your head there. Can you smell the detergent? Maybe cologne? Is the shirt he is wearing soft? What do you hear? A heartbeat? His breathing? Maybe Jesus is softly humming one of your favorite songs? Is he gently rocking you? Rubbing your head? Scratching you back? Does he say something to you or does he simply hold you in his arms knowing that his embrace speaks more than any words? What do you notice in your visualization? While Jesus is not physically with you each day, this visualization is an invitation to remember that Jesus is with you always--that you are never alone. The loving embrace of God is always awaiting you. This holiday season, I give thanks for the strong and loving arms of Jesus that are as near as the next moment that we choose to close our eyes and think of him. At the beginning of this month I took a moment in this email to encourage everyone to make this a whole month of gratitude. Well, here we are that the main event: Thanksgiving week. The seven-day countdown begins now. Between today and next Thursday, I really encourage you take some time each day to pause and be grateful. I have seen a few of you posting things for which you are grateful on Facebook. You could do that, or perhaps you could write out a list of gratitudes in your journal, make it a dinner conversation each night, or come up with another creative way to focus on gratitude this Thanksgiving. A good way to be sure to follow through is to do your gratitude practice at the same time of the day each day and try to connect it to something in your normal routine. As a way of practicing what I am suggesting, I will share a bit of my gratitude with you here. Today, I thank God for each of you. Truly. This week marks five years since I moved to St. Louis, and so I have been thinking about our time together. We have faced some challenges as a church this year, but we did so by trusting each other and never losing sight of the promise that God is preparing a new path of ministry and growth for us (Jer. 29:11). I am thankful to continue to walk in gratitude and hope as I/we eagerly await what God will do through us in the year ahead!